Rates of diabetes vary across the country, with Colorado, Utah, and Minnesota having the fewest incidences overall. 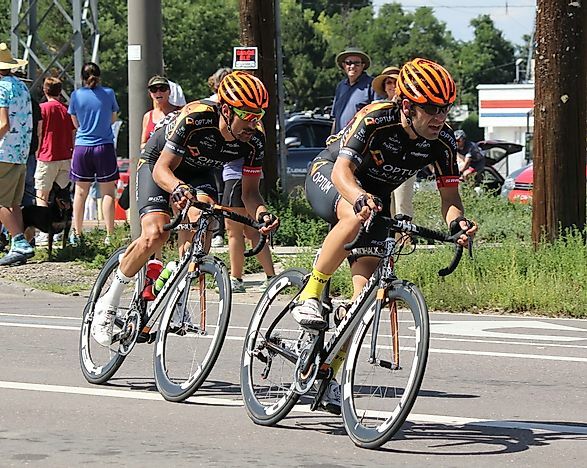 Two cyclists race in Denver. Known for their physically active lifestyles, Coloradans have the lowest diabetes rates in the US. Diabetes rates have nearly doubled in the United States over the past twenty years. Rising from a prevalence of 5.5 percent in the years between 1988 and 1994, the numbers had reached 9.3 percent between in the period between 2005 and 2010. Today, more than 29 million adults in America are believed have diabetes, with another 86 million being pre-diabetic or lacking insulin sensitivity. It is estimated that nearly one in three adults in the US will have diabetes by 2050. Also, diabetes happens to be the seventh leading cause of death in the United States, and is believed to cost the country nearly $245 billion in medical costs and productivity losses a year. With that said, there are certain US states that stand out for having few incidences of diabetes relative to other areas of the country. A few of these are looked at below. Diabetes is a metabolic disorder characterized by high blood sugar (hyperglycemia) due to insufficient secretion of insulin or insensitivity to this hormone. High levels of blood sugar can lead to severe consequences, including organ failure, loss of sight, neuropathy, coma, and even death. Stress, inactivity, nutritionally-poor and energy-dense diets, and being obese are not only correlated one with another, but can also work either independently or interdependently to decrease the human body’s ability to secrete insulin and its sensitivity to its actions. Sadly, all of these factors are commonly seen occurring in greater frequency across the United States and the developed world as a whole. The US state with the lowest incidences of diabetes is Colorado with only 6.7% of its adult population being diagnosed with it, with its fellow Western state of Utah sharing similar statistics. Although Type 2 Diabetes is on the rise across the nation, the people of Colorado and Utah have long remained on the lower end for rates of the disease, and their populaces are often considered healthier in general as compared to those of other US states. This particular type of diabetes, also known as Non-Insulin Dependent Diabetes (NIDDM), accounts for nearly 90% of cases in the country, and is associated with factors like obesity, inactivity and old age. Although once rare, NIDDM is being seen more and more in children as American youths’ lifestyles become increasingly sedentary, calling into question it denotation as “adult-onset” diabetes. It appears the people of both these states have kept the disease at bay with healthy food choices, weight loss and lots of physical activity. The state with the third lowest incidence rates of diabetes is Minnesota, with only 7.3% of its adult population suffering from the disease. Still, the number of people living with diabetes in Minnesota had actually doubled between 1994 and 2010. The 7.3% figure for individuals mentioned here are those who have been diagnosed by their health care provider to have diabetes. Meanwhile, a population of another 80,000 Minnesotans are thought to have the disease without even knowing about it. Next in line is the state of Vermont, with 7.7% of its adult population suffering from diabetes. After that there falls Alaska, with a 7.9% rate of diabetes incidences in the state. Considering the health status of the entire population of Alaska, it is estimated that about 30% of its citizens suffer from pre-diabetes. Native American populations are at a statistically greater risk of having diabetes, which may also affect Alaska and other states with large populations of peoples with native American ancestries. The states of Massachusetts and Montana are next on this list with 8% of their adult population diagnosed with diabetes, while 8.2% of Iowa’s, North Dakota’s and Wyoming’s respective adult populations are also known to suffer from the disease. Next come the states of Hawaii, Nebraska, Rhode Island, and Wisconsin, with 8.4% of their adult populations being diabetic. The states of South Dakota, Pennsylvania, Maryland, and Kansas each have around 9.5% of their respective adult populations suffering from diabetes, while Idaho has a rate of 9.4% and Oregon and Connecticut, 9.3%. Considering that even the states with the lowest rates of diabetes have rates that are still very high in comparison to global norms, it is safe to say that diabetes is a disease endemic across the United States. As lifestyles become increasingly sedentary, the disease is continuing to increase its presence nationwide, and, even more sadly, is becoming more and more common among young Americans. Nationwide initiatives to increase awareness of the disease, and the lifestyle and dietary habits that promote its proliferation, are needed. Proactive steps to combat it are critical as well. Intensified efforts should be made in the populations most at risk for developing the disease, including minorities and people of low income and educational levels, especially in the states where rates are higher than the already high national average.